For the community in Ontario, see Redditt. Reddit is a website comprising user-generated content—including photos, videos, links, and text-based posts—and discussions of this content in what is essentially a bulletin board system. The name "Reddit" is a play-on-words with the phrase "read it", i.e., "I read it on Reddit." As of 2018[update], there are approximately 330 million Reddit users, called "redditors". 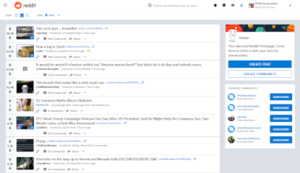 The site's content is divided into categories or communities known on-site as "subreddits", of which there are more than 138,000 active communities. Reddit was originally written in Common Lisp but was rewritten in Python in December 2005 for wider access to code libraries and greater development flexibility. The Python web framework that Swartz developed to run the site, web.py, is available as an open source project. As of November 10, 2009[update], Reddit used Pylons as its web framework. Reddit was an open source project from June 18, 2008 until 2017. During that time, all of the code and libraries written for Reddit were freely available on GitHub, with the exception of the anti-spam/cheating portions. In a September 2017 announcement, the company stated that "we've been doing a bad job of keeping our open-source product repos up to date", partially because "open-source makes it hard for us to develop some features 'in the clear' ... without leaking our plans too far in advance", prompting the decision to archive its public GitHub repos. As of November 10, 2009[update], Reddit decommissioned its own servers and migrated to Amazon Web Services. Reddit uses PostgreSQL as their primary datastore and is slowly moving to Apache Cassandra, a column-oriented datastore.[when?] It uses RabbitMQ for offline processing, HAProxy for load balancing and memcached for caching. In early 2009, Reddit started using jQuery. Reddit is a private company based in San Francisco, California. It has an office in the Tenderloin neighborhood. Reddit doubled its headcount in 2017; As of 2018[update], it employed approximately 350 people. In 2017, the company was valued at $1.8 billion during a $200 million round of new venture funding. The company was previously owned by Condé Nast, but was spun off as an independent company. As of April 2018[update], Advance Publications, Condé Nast's parent company, retained a majority stake in Reddit. AMAs, or "Ask Me Anything" interviews, are among Reddit's most popular features. As of August 1, 2018[update], r/IAmA, which is the most popular community for AMAs, was the eighth most popular subreddit on the site with 17.7 million subscribers. During an AMA on r/IAmA and other subreddits, users can ask questions to interviewees. Notable participants include then-United States President Barack Obama (while campaigning for the 2012 election), Bill Gates (multiple times), and Donald Trump (also while campaigning). AMAs have featured CEO Steve Huffman, , as well as figures from the entertainment industry (including Elizabeth Banks and George Clooney), literature (Margaret Atwood), space (Buzz Aldrin), privacy (Edward Snowden), and others, such as experts who answered questions about the transgender community. The Atlantic wrote that an AMA "imports the aspirational norms of honesty and authenticity from pseudonymous Internet forums into a public venue". After Ellen Pao became CEO, she was initially a target of criticism by users who objected to her lawsuit[clarification needed]. Later on June 10, 2015, Reddit shut down the 150,000-subscriber "fatpeoplehate" subreddit and four others citing issues related to harassment. This move was seen as very controversial; some commenters said that the bans went too far, while others said that the bans did not go far enough. 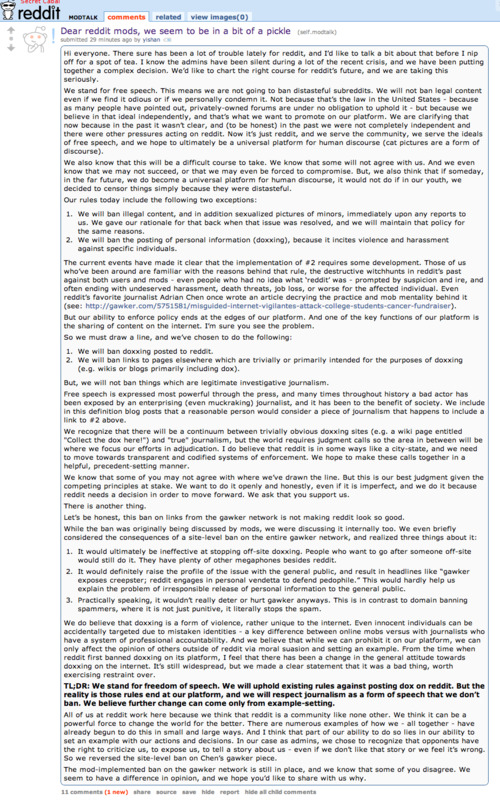 One of the latter complaints concerned a subreddit that was "expressing support" for the perpetrator of the Charleston church shooting. Responding to the accusations of "skewed enforcement", Reddit reaffirmed their commitment to free expression and stated, "There are some subreddits with very little viewership that get highlighted repeatedly for their content, but those are a tiny fraction of the content on the site." ^ "Thousands of Reddit users are trying to delete Google from their lives, but they're finding it impossible because Google is everywhere".